It’s CLO Outing Time Again! If you come to Chengdu, there are two images that will be burned to your retinas within days of touching down, two things you can’t travel more than a few miles in the city without seeing: pandas (of course) and the city seal. The pandas speak for themselves- adorable (although evolutionarily backwards) creatures just begging you to pay $300 to hold them. (Yup! That’s the going rate in Chengdu right now. $300USD so you can be completely covered in blue plastic and hold the little critter for just long enough to get the photo snapped and then away it goes. It comes to about a Benjamin per minute.) The city seal, on the other hand, is less well-known outside of Chengdu, but once you touch down in the city, you’ll see it everywhere. The golden ring adorns the side of the ubiquitous green cabs (well, ubiquitous when you are trying to cross the street, absolutely absent when you need one to get home from work), it sits atop NiJia Qiao (commonly called the “A Bridge” by consulate folks) and pops up on a variety of signs and billboards around town. In 2001, as Chengdu was just starting to hit its construction stride, workers stumbled upon a large area filled with elephant bones and the remains of an ancient civilization- right in the middle of the city! Needless to say, construction came to an abrupt halt and archeological excavation commenced. Within that site, scientists found numerous jade and bronze pieces, as well as the now famous city seal- a piece of sliver-thin gold foil carved with a sun in the center, surrounded by four stylized birds. After having this golden emblem appear around every corner, I figured it was time I made the (very short!) trek out to the JinSha Museum to have a look for myself, and what better way to do that than to organize a CLO outing! So, Saturday morning, I gathered about fifteen other consulate community members, we loaded up in a bus and headed across town to discover for ourselves the newly discovered site. If you’re in Chengdu on vacation for more than just a day or two, I would definitely recommend the museum. It starts with the actual dig site, where elephant tusks still protrude from the hard earth and visitors can walk through the carefully gridded work space. Then, it is on to the main building which is now home to the all-important city seal, several other gold foil masks and an array of jade and bronze carvings. But, if you are LIVING in Chengdu, I would recommend the site not for the museum itself (although it is nice and worth a visit or two), but for the grounds on which it sits. In a city where sunshine is rare and large expanses of grass even rarer, it was amazing to walk through the front gates, past a beautiful water fountain and into what looked like a park that could be found in any American city. There was grass and trees and benches and room to run! The 80RMB entrance fee may seem a little steep, but if I had young ones, I’d wait for a day where the air monitor readings were moderate, pack up my crew, throw together a basket of food and head out to the museum for lunch in the park. The day out would be worth the ticket price! What’s black and white and cute all over? Pandas! What’s round and gold and ringed with birds? The city seal! Put them together and what do you have? CHENGDU! “Foreign Service? Sure! That sounds great! With my teaching degrees and background, I’m sure I’ll be able to land a job as we jump from country to country from now until retirement. Hauling boxes of young adult books and hard copies of fabulous lesson plans trans-Pacific/Atlantic will be no problem at all. I’ll go pack my bags right now!” These were the thoughts running through my head as Thad passed test after test to land himself a dream job with the US Department of State. Because yes, I do have a bachelor’s degree in English/Spanish teaching; and yes, I do have a master’s degree in middle level education; and yes, I have taught for seven years in the US and two in China; but no, I cannot just jump on the first job opening at the local international school in each new posting. You see, when traveling with the State Department, the list of rules/regulations is longer than the Christmas list of my five year old niece. (It does include much, much less Hello Kitty. As I think about it, though, a little pink and glitter would liven of the FAM guidelines a bit. ) Some countries allow spouses to work on the local economy and some do not. While the reasons for the prohibitions are as numerous as the aforementioned Hello Kitty swag on the Christmas list, the outcome is still the same: if there is no bilateral work agreement with the host country, the diplomatic spouse cannot work. That is the boat I am currently floating along in in China. Because there is no bilateral work agreement here, as I was exploring my employment options in Chengdu, I was told that I was not allowed to apply for jobs at the international school, even though there were openings that would have been perfect for my background. Although I was initially disappointed, my spirits were revived when I saw the Community Liaison Officer (CLO) position would be opening up within weeks of our arrival. With impeccable timing and a lot of background working with people in various capacities, the CLO job ended up being a great fit. I’ve been lucky to work under fantastic management during my introductory year to State and had a great time expanding the CLO position in Chengdu. It has been a great way to spend my time in Chengdu. But, at heart, I am a teacher. I miss teaching, especially literature and writing. (My middle school niece recently started her own blog and I’ve been pestering her constantly about what she is writing about, excited to see some middle school creativity again! She may soon start ignoring me on G-chat messages if I’m not careful.) So, while at times I’ve felt a bit discombobulated by the lack of lesson plans to write or expository essays to edit, I’ve comforted myself with the thought that I’ll be back in the classroom in 2014. Much like the royal baby, there was great anticipation for bidding season. (This is an appropriate simile, as you may remember that I wrote a long post comparing Foreign Service bidding to having a child. Check that one out here.) We waited with eager expectancy to find out where we would spend (aka: where I would teach) the next two years. And at last we got the coveted email: Kuala Lumpur. Great! It is warm (hot!!) year round, the travel opportunities are endless and the cutest baby elephant I’ve ever seen lived in Malaysia. I’ll go pack my teaching bags right now! After the excitement (and shock!) of our posting wore off, I did what I always do- research and obsess. Before the news had even been announced to all of our family and friends back home, my Amazon cart was filled with books (both fiction and non-fiction) about Malaysia and I bought the Malaysia, Borneo, Singapore Lonely Planet at a bookstore in downtown Taipei. I plied through document after document from the embassy in KL, reading everything I could get my hands on about housing, transportation, community events…and work. Much to my chagrin, I soon realized that diplomatic spouses in Malaysia are facing the same struggles that the ones in China are- no bilateral work agreement. Long story short- I can’t teach in the international school in KL either. Frustration doesn’t begin to do justice to the moment. “Foreign Service? Sure! That sounds great! With my teaching degrees and background, I’m sure I’ll be able to land a job as we jump from country to country from now until retirement. I’ll go pack my bags right now!” I may not have had a clue what I was talking about a few years ago, but I still think the Foreign Service sounds like a great idea and I am still convinced that I can use my teaching degree as we bounce from post to post. It is just a matter of expanding my teaching tool kit and looking at education-oriented jobs outside a traditional classroom setting- both of which are exciting prospects. I was initially drawn to the book because it centers on a (possible) earthquake and I have a bit of a history with those myself, but I didn’t expect the book to revolve so heavily around relationships and the ties that bind a family. The story took a decidedly different turn from what I had expected, but it was not an unpleasant journey. 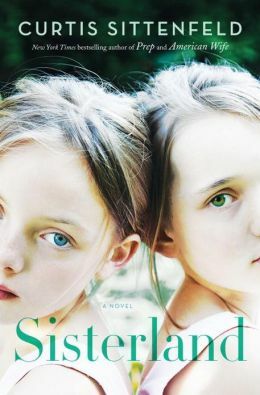 Curtis Sittenfeld’s latest book weaves the tale of twin sisters, Daisy and Violet, who were born with the gift (curse?) of having premonitions of future events. (As the girls realize they have an ability not shared by all, they call their power their “senses,” not knowing how else to label it, as any discussion of their ability is quickly muted at home.) These shared senses are nearly all the two have in common as adults. While Violet embraces her ability, dropping out of college after just a few weeks because Guardian (a spirit guide who came to her for the first time while she studied in her university library) told her she had a different path to take in life, uses her skills as a source of revenue, holding séances and readings, Daisy runs in the opposite direction from her abilities. After starting college under the guise of her middle name, Kate, and then taking her husband’s last name after marriage, she has effectively closed the door on her history as one of the twins with senses. No one can track her or immediately connect her with her outspoken sister. A back story of a clinically depressed mother overwhelmed by life and school years besought with bullying and name-calling (the twins were well-known to be “witches) helps the reader see why one sister might embrace the notoriety that would come with premonitions of the future while another would turn tail and run. Basing a book on the idea of extrasensory abilities has the potential to head towards comic book storylines, but Sittenfeld’s characters are well-rounded and deeply developed so the reader imagines them as real people and not people who belong in Lycra uni-tards on the big screen, saving the world through the destruction of evil. The two women live near each other, and near their aging father, their relationship is strained when Violet publicly announces that she senses an earthquake will soon ravage their home state. Kate is suddenly drawn back in to a world that she swore off after the birth of her first child. Up until this point, I really enjoyed everything about the book. The strained, but loving, relationship of the family is one that is relatable to many readers and the plot flows well. But, I can’t walk away from this review without one minor grievance: Kate is a stay-at-home mom and is good friends with a stay-at-home dad up the street. (Conveniently, her husband works with his wife at a local college.) The problem lies in the cliché. While the two have been friends for years, suddenly their relationship jumps to a whole new level, once again playing into the idea that it is impossible for a man and woman to have a truly platonic friendship. Plus, this bit of indiscretion on Kate’s part creates a whole new storyline as the consequences of her choice create far-reaching ripples, but ones that don’t entirely play out in the narrative before the books ends. For the longest time, all through high school and college, I shied away from non-fiction books that weren’t on my required reading lists. My image of non-fiction was one of drily written tales that read like epic encyclopedia entries; just the facts, ma’am. But, about seven years ago I stumbled upon Devil in the White City by Erik Larson, turning my notion of non-fiction writing on its head. (Stumbled upon isn’t entirely accurate. I was a Peace Corps Volunteer in western China, starving from a lack of reading material and was handed this book. Whereas a year before I would have turned my nose up at it, literary deprivation had taken hold and I devoured the paperback, cover to cover, in just two days.) Since my introduction into the new world of non-fiction, I’ve read everything from real-life accounts of floods in Pennsylvania (The Johnstown Flood by David McCullough) to adventures in the far reaches of the Amazon (The Unconquered by Scott Wallace), not to mention a bevy of memoirs. 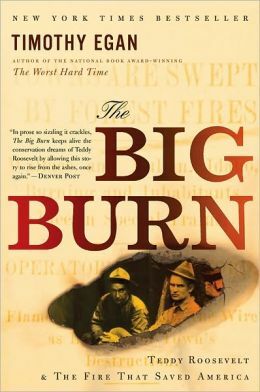 My most recent foray into the world of non-fiction was The Big Burn by Timothy Egan, a tale of the birth of our national park system and the fire that nearly destroyed it. As a frequenter of the American national parks, the book drew me in with the history of how these lands were set aside and preserved for future generations, which was no easy task as industry leaders would rather turn a profit off the wood and minerals available, building a dynasty for their family, rather than create a lasting legacy for the entire nation. Egan does a great job giving the background of this fight, leaving the reader feeling like they “knew” Teddy Roosevelt and Gifford Pinchot. With a strong back story set, Egan then pushes the reader through the harrowing forty-eight hours that were “the big burn.” Connections between the reader and the characters, as well as the reader and the land, create a sense of panic and fear as the fire ravages the mountain ridges of the northwestern forests. I could feel the flames licking my hands as I turned the pages; I could feel the heat of the fire as it rushed over fireman huddled in creeks under wet blankets and hunkered down in ravines and caves; I could feel the air rush out of the room as the fire stole away the oxygen, leaving noxious poison in its stead; and I could feel the fear of men who were moments away from their painful deaths. Travel by superlatives- it is the way to go. As we’ve wandered the world, sometimes with just backpacks filled with the essentials and other times with shipments of all our worldly goods, we’ve always loved seeking to the biggest, the longest, and the farthest of all our destinations. In Cambodia we visited the world’s largest religious monument – Angkor Wat. In Argentina we slowly made our way across Avenida 9 de Julio, the world’s widest avenue. (It took several changes of the light to make it from one sidewalk to the next, but luckily the city has built-in pit stops in the center!) And don’t forget our own American superlatives such as General Sherman, the world’s largest single tree, in the Redwood forest or the world’s largest museum complex- the Smithsonian. But, when it comes to “-ests” of the world, don’t count out China. After all, it is home to more people than any other country on Earth. The Chinese government loves its superlative sites. We’ve been to Urumqi- the city in the world farthest from an ocean, Le Shan- home of the world’s largest sitting Buddha, and of course, the Great Wall- the world’s longest fortification. (Oh, and don’t forget our visit to the Macau Tower a few years ago, where Thad and John T. decided it was a good idea to bungee jump off of what was then the world’s highest bungee point.) Heck, just this week China took home another superlative title, although this one a bit less pride-inducing- Chinese airports are the most delayed of any in the world. With less than 19% of Beijing’s flights leaving on time, the record is dismal, but not at all surprising to those of us who depend on those Air China flights through the capital to get in and out of the country. Chengdu, not wanting to be left in the superlative dust, just premiered their own “-est” attraction. On June 28, the doors officially opened on the world’s largest building-The Global Center. Some of us have lovingly given it the nickname The Death Star, as it is nearly as big as George Lucas’ moon-sized space station. With a Facebook feed full of links to online articles about the city’s newest addition from friends and family, what choice did I have but to venture and out see this incredible structure for myself? Saturday morning was the day! Thad and I took the subway out there, meaning we got to enjoy the panic that is a line change at Tianfu Square. (No matter the time of day or the time span between trains, people get off one line and sprint to the other. I was nearly trampled by a tiny woman fully decked out in neon and sporting three-inch heels as I made my way up the stairs between lines, only to stand next to her for five minutes as we all waited for the blue line train to arrive.) The metro system has a stop directly below the Global Center, making our initial scouting trip to the building an easy one. After rising from the subway tunnel like a Morlock, into the midday brightness (not sunshine, as I’ve not metro-ed myself to the countryside), and blindly blinked as my eyes adjusted to glare of the orb from above, I looked up to see a colossal building, covered in glass, with each corner flipped up like a wave, echoing the traditional Chinese architecture seen on Buddhist temples throughout the country. I’ll give you this Chengdu- it is impressive! Making a beeline across the scorching hot, white tile that makes up the courtyard in front of the Center, we initially tried to enter through a giant door that we soon realized went the office spaces in the upper regions of the building, so we skittered on down the square until we found the revolving doors that breezed us on into the mall section of this city-sized creation. Inside, we were greeted with an expanse of marble (looking?) flooring, buffed to a high shine that would make even the most demanding butler proud. Choosing between the never-ending escalator that went directly to the fourth floor or a visit to the indoor water park, we opted to start at the latter. I couldn’t wait to see the park that boasts daily sunrises and sunsets on the world’s largest LED screen. Off to the far side of the Death Sta…er, Global Center, we go! As we made our way through the amateur photographers camping inside the front doors with cameras that weigh nearly as much as I do propped on hefty tripods, it didn’t take long to realize that while the building was open, it wasn’t OPEN. We passed storefront after storefront advertising what *would* be there in the near future. There will be a Lotte’s Department Store; there will be an H&M; there will be a bookstore (fingers crossed on that one! ); there will be an IMAX theater. But what IS there? A Toys ‘R Us and an overpriced Vietnamese restaurant. Oh yes, there are also a lot of exposed wires sticking out of the glossy marble floor and more than one puddle of standing water on upper floors of the expansive shopping center. After passing “coming soon” signs in the display windows of nearly every store in the building, we reached the indoor water park- which looked amazing! The Rainbow Bright colored slides twisted and turned from huge heights, the spiraling tube-rides beckoned in reds and purples and the sandy beach was just waiting have the wave pool crash over it in set intervals that would make Old Faithful green with jealously. Theoretically, the park looks fantastic! But, my realistic side says I’ll never spend a day there, clad in my polka-dot swimsuit, enjoying water world fun on a chilly late autumn afternoon. It looked bright and shiny and new on Saturday, but once the doors open and the masses arrive, all splendors will soon fade away as toddlers without diapers turn the beach into a giant litter box and a culture with infinitesimal personal space bubbles takes up every square inch of play space. One of my favorite parts of the not-yet-open water park was not in the recreation area at all, but rather on the outskirts where cabanas will be home to a variety of snack stands and souvenir stores. One little restaurant advertised itself as having all manner of casseroles available. Because, what doesn’t say “a day at the beach” like a nice, creamy casserole? In its quest for a superlative of its own, Chengdu has gone above and beyond in the world of architecture. The city has created a building like no other. (Seriously. No other.) As its galactic destiny comes to fruition over the coming months, I plan to make another trek out there to see it is all its glory. I probably won’t be buying much and I definitely won’t be swimming, but I will go wander the lustrous marble floors and enjoy knowing I’ve added yet another superlative to my own travels. If you’re like me and always scroll to the bottom of a book review to see what “ranking” it received before going back through and reading the review itself, let me warn you that this one is a bit deceptive. Don’t give up on this book just because I didn’t love it. Touched by Kim Firmston is the kind of book I would buy for my classroom in a heartbeat even though on a personal level I didn’t love it. You see, as a middle school teacher, I often ran into 8th graders who were reluctant to pick up a book. For a variety of reasons, reading wasn’t fun for them- it was work and no one wants more work. This book is written for those who may shy away from books because their reading level doesn’t match their interest level when it comes to many of the options on the library shelves. Touched is about Ethan, a high school student with amazing computer skills. When Ethan feels like his dad isn’t paying him enough attention, he decides to use his electronic aptitude to make his dad sit up and notice him. 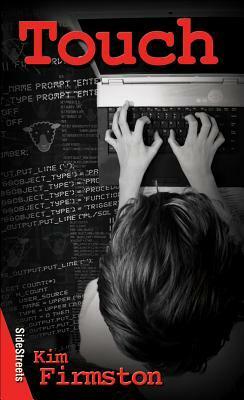 Ethan hacks into his school’s central computer system, installing a virus that he is sure will catch his father’s attention, since his dad works in electronic security. But it doesn’t because his father is too preoccupied with Ethan’s step-sister’s meltdown. Haley is a few years younger than Ethan, and they used to be close, but lately she’s been rebelling, focusing all the family’s attention on her. As she focuses inwards, Ethan pushes harder to be noticed, but in trying to impress his dad he starts sabotaging his relationships at school. With things spiraling out of control at school, Ethan’s home life matches it negative step by negative step. Then, accusations of molestation emerge. Ethan is left without a support network of friends and wondering who to trust.